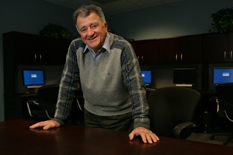 Professor Anthony Ephremides is the 17th recipient of this IEEE MILCOM Lifetime Technical Acheivement Award. Cynthia Kim Eminent Professor of Information Technology Anthony Ephremides (ECE/ISR) has been awarded the 2014 IEEE MILCOM Lifetime Technical Achievement Award. Ephremides is the 17th recipient of this award; it will be presented to him at the annual Military Communications Conference to be held in Baltimore, Maryland, from October 6-8. This Military Communications Conference award is for someone who has made long-term important technical contributions to military communications as evidenced by significant, high-quality, technical publications in the unclassified records of the IEEE Military Communications Conference. “I am very pleased and honored that my work on wireless networks with applications to, among other things, military communications has been recognized by MILCOM, the only IEEE international conference that focuses on military communications with a rich history of several decades. The distinction also reflects on the University and the many students with whom I have had the chance and privilege to work,” said Professor Ephremides. MILCOM, in its 33rd year, is the premier international conference and exposition for military communications and brings together military, academic, and industry leaders. The technical program includes paper presentations, panel discussions, and tutorial. In addition, the exhibit floor highlights industry innovation, products and solutions. MILCOM is co-sponsored by AFCEA International and the IEEE Communications Society; this year Raytheon is the conference host. For more information, visit this website: http://www.milcom.org.